On day 2 the Illustrator Winners started bright and early, meeting down in the lobby of the Loews Hotel. They began with a tour of the famous Author Services building. Floor to ceiling, the sheer prolific nature of L. Ron Hubbard’s career is always a great milestone to aspire to. Towards the end of the tour, Joni brought them into the Writers and Illustrators of the Future Lounge where, in addition to all the published works from past writer and illustrator winners, photos of all the judges were up along the walls, along with each of the 32 volumes of the Writers of the Future anthology proudly displayed. 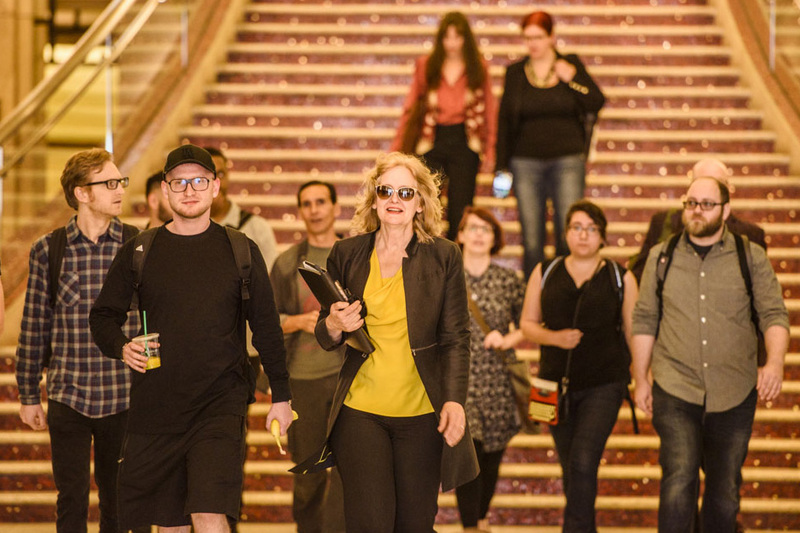 Now knowing the full breadth of the Contests’ legacy that they were now a part of, the winners headed down for the opening seminar. Echo and Lazarus began at a ferocious pace providing a lot of information. Luckily each winner had their notebook to write down their questions for later, of which there were many. During the beginning of the seminar, Echo and Lazarus went over several subjects including Illustration vs. Fine art, the many hats you must manage as an artist, and how buyers see your service—already providing considerably more than the “20-minute optional class on the business of art” Echo had received when she was in art school. In the afternoon the winners returned to another informative session. Lazarus broke down how to price one’s work for the bare minimum fee, enlightening the winners about pricing in general and ethical guides. Echo and Lazarus provided handout kits with information on licensing, negotiations, business plans, sample contracts, who you contact and how to read creative briefs. Our newest Illustrator judge, Ciruelo, just arrived from Spain, brought his advice learned from over 30 years of experience of having worked with publishers from all over the world. He reinforced the importance of being able to recognize and communicate the needs of the client so as to make the client happy. This involved knowing why they hired you, and then how your work should go beyond just fulfilling the needs of the client. He reminded the winners to nurture their artistic voice so that they continue to grow. Val Lindahn also reflected on the importance of doing your personal work as the passion will shine. Starting out from the hotel to the workshop. 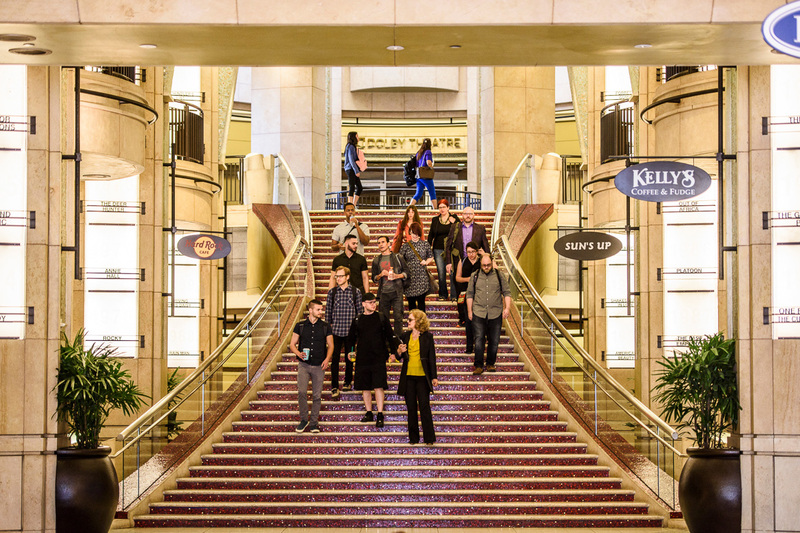 En route to the workshop, going down the stairs that lead up to the Dolby Theatre, where the Academy Awards take place. Walking past the Chinese Theatre on Hollywood en route to the workshop. Meeting execs from Author Services, Inc. in ASI’s reception. Getting a tour of the L. Ron Hubbard Library. Getting a tour of the Writers & Illustrators of the Future room where the Contest judges and winners works are featured. Illustrator Contest judge Echo Chernik getting the workshop rolling. Yader Fonseca, far right, asks a question. Illustrator Contest judge Lazarus Chernik giving a seminar during the workshop. Rachel Quinlan working on her assignment from the workshop. Ryan Richmond working on his illustration assignment. Hanna Al-Shaer working on her illustration assignment.